Tomatoes are high in multiple different vitamins and this makes them an all-round great food to include in your daily diet. Tomatoes are often referred to as a vegetable, although in fact they are classified as a fruit. It’s understandable that this confuses many people, since tomatoes are normally stored in the supermarket in the vegetable section! Tomatoes are high in multiple different vitamins and this makes them an all-round great food to include in your daily diet. You can expect to treat your body to good doses of Vitamin A, B6, C and K. Magnesium, copper, niacin, thiamine, phosphorus, potassium and folate are all well represented in the unassuming tomato. The best tomatoes are bright red in color, have a smooth skin with no wrinkles and are firm to the touch (of course there are many varieties of specialty tomatoes which are different colors like black or yellow too). When a tomato becomes squishy and over ripe it is best used to make sauces or casseroles. When tomatoes are no longer suitable for eating they will develop black spots on the fruit and the skin will pucker. Remember to store them in the crisper section of the refrigerator and regularly check them to make sure they have not turned black. 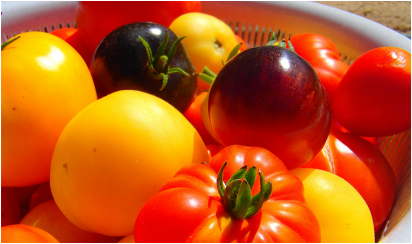 Tomatoes that are not yet ripe enough to eat are commonly put on a windowsill in mild sunlight to ripen. With a very high water content, tomatoes are not suitable for freezing unless you plan to use them for cooking. Should your refrigerator be too cold, the water content in your tomatoes will quickly freeze and then go soft when they are thawed. Tomatoes have low levels of saturated fat, cholesterol and sodium. They also contain very few calories, which is another great reason to include a lot of them in any healthy diet. 1. Eating tomatoes is thought to reduce the risk of prostate cancer as well as other cancers like throat, pharynx, esophagus, mouth, cervical, lung, stomach, colon and ovarian cancers. Lycopene is the ingredient that promotes these health benefits. It is thought that the Mediterranean diet, where tomatoes are cooked with olive oil, contributes to low rates of cancer in Mediterranean countries. 2. You may not realize that tomatoes are high in calcium. This means your bones benefit when you include this fruit in your regular diet. As mentioned, tomatoes contain vitamin K, which is also beneficial for keeping bones healthy and strong. Lycopene, once again, plays a part in strong bones as it is known to improve the bone mass. This is especially important as you start to age and diseases like osteoporosis start to make themselves known. 3. If you’re having trouble getting a good night’s sleep try drinking a glass of tomato juice before bed. You’re sure to have a much better slumber. 4. Tomatoes are fabulous for your skin. High levels of lycopene are known to help with the signs of aging like wrinkles, fine lines and damage from the sun. Lycopene is an antioxidant with many health benefits for skin. 5. Smoking creates carcinogens that can damage your body. Chlorogenic and coumaric acids both can protect the body from the carcinogens created from cigarette smoke. 6. Antioxidants are high in tomatoes. This means that free radicals in your body can be neutralized and cell damage can be minimized. 7. Vitamin A in tomatoes brings many health benefits. You’ll notice stronger and shinier hair when you have good amounts of Vitamin A in your system. Not only that – your skin, nails and teeth will all show signs of improvement due to vitamin A. 8. Your eyes will thank you when you eat a lot of tomatoes. Vitamin A and vitamin C in tomatoes can help improve your normal vision as well as help to prevent the development of night blindness. Vitamin A is thought to be a contributing factor in the prevention of eye ailments like macular degeneration and cataracts. Several other antioxidants in tomatoes help to protect the eyes from damage caused by light. 9. Diabetics should include tomatoes regularly in their diet. Chromium helps to regulate blood sugar levels. Tomatoes have very few carbohydrates and are high in fiber. All traits that assist to keep blood sugar levels at a safe level. 10. Vitamins A, B, C and potassium make tomatoes good for hearts! They work to reduce cholesterol, to lower blood pressure, prevent stroke and also work together with other nutrients to reduce the chance of heart disease. As you can see there are many health benefits to the common tomato. But tomatoes aren’t just good for you, they are actually lovely to eat. They are an adaptable fruit that can be eaten in salads, on sandwiches, in soups, curries and casseroles. As tomatoes cook down they add amazing flavor to any dish. What’s your favorite way to include tomatoes in your diet?